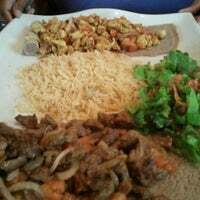 I love my kitfo raw... however... desta serves kitfo pasta that is really good IF the meat is cooked well done. (I've tried it both raw & cooked) also their fish pasta is also amazing & its a lot. Ask yourself, "Do I LOVE rare steak and sushi?" Then consider the rare kitfo. 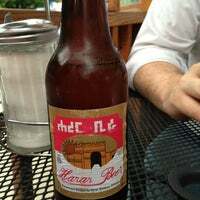 It's not for everyone, but it's FANTASTIC (and much better than what you get elsewhere locally). 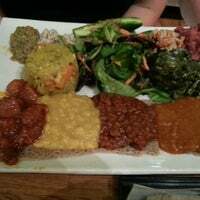 First time with Ethiopian cuisine and it was divine! 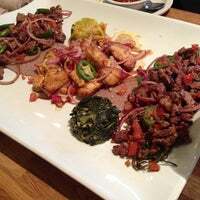 Try the Fish tibs and the Kifto, medium well with kocho. 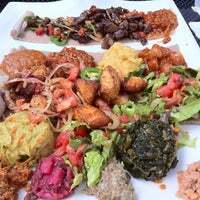 It was healthy and amazing..
For beginners I recommend the Chicken Tibs... ALWAYS ADD MISER & SHIRO TO YOUR MEAL... The Goden Tibs are sooooo good! The lamb tibs are tasty. The tiramisu cake is good but the portion us small. The food is delicious. The menu has a lot going on and is somewhat confusing and disorganized. This is my first visit.I definitely plan on returning to try other dishes. Awesome food. Everything I have tired was well made and very tasty. Even the coffee. We love the Meat Lover😋 The food here is amazing!! 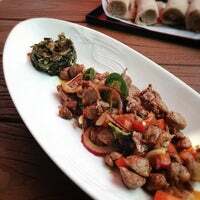 Get the lamb tibs and vegetarian platter to share. Enjoy your meal with a glass of honey wine. Best lamb in town! Amazing samba and any tubs dish....and don't forget the fish pasta just be sure to mention no jalapeño for kids. Every dish we tried was excellent! The sides were amazing. I would come back just to order all the various sides! I got the lamb tibs with rice and tomato fit fit...OMG! IT WAS SO GOOD! My drink was Also delicious! The fish tibs changed my life...absolutely delicious! And don't forget to get a glass of honey wine too. Veggie platter so good!!! 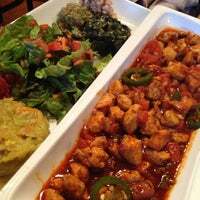 and the chicken is always great with the injera. The food is amazing. I especially like the ribeye. However, after two visits, I've concluded the service is marginal at best. Ribs tibs are absolutely delicious with awaze sauce! Also love the tomato fit fit, rice and collards. 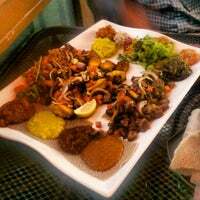 Love Desta spicy lentil stew and fish ribs are what to order here. Staff is great. Get table on the patio. Totally worth it when weather is awesome. 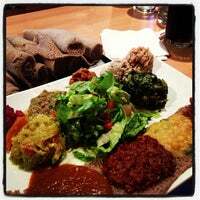 I can just go on eating Injera...healthy good food. Good food selection and reasonable prices. They allow you to substitute the sides in the vegetarian platter to include your favorites. Best Ethiopian food tasted period. Order the meat lover. Perfect for a group of 4. 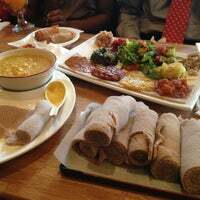 Very friendly staff and they make awesome recommendations with unlimited amount of injera bread! For two people, split one Tibs platter with a ton of extra sides. It'll be plenty. 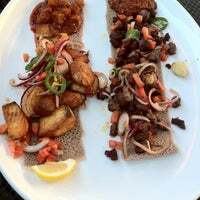 Get the tibs cooked with something - rice, injera, etc. Makes for more food and just a better meal altogether. Service was excellent. Very savory food. A little bit spicy at my taste but great flavors! I get the chicken tubs with injera bread and gomen. Their fish salad is good too.. 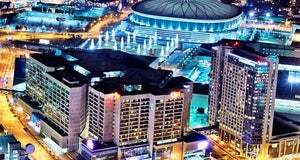 I just love this place... And besides great food the people couldn't be more friendly and helpful. Tasty kitfo and lamb tibs. The red lentils and other veggies are awesome too. Delicious food. Great service. Staff are super nice. Lively ambiance. The food is seasoned well. I had chicken. I wasn't a fan of the greens or the cheesecake, but the entree was good. The lamb tibs were delicious - but the cabbage was amazing! Make sure you order some as your side! Bring your friends along so you can do a big platter! 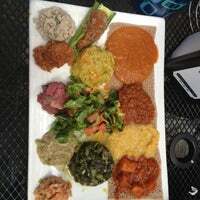 The fish tips with injera bread and greens are great! Fish tibs + rice + gomen + axumite (wine) = happy girl. Amazing food & service. 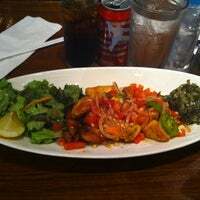 "The veggie plate was delicious! 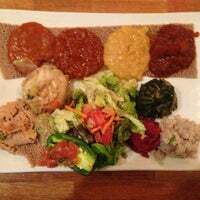 The lentils were among the tastiest I've had..."
"Get the awaze tibs or derek tins with missir. Awaze is spicy!" "Don't judge a book by its cover. 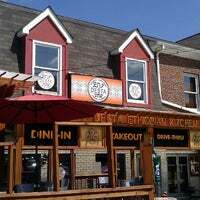 Friendly staff and good food." "Try the Orange & Mint Hookah, it's beyond amazing." "Prueba el grill chicken Jamaica style"
"They have Stack-cups full of Cold Beer , Good Food & lots of TVs :)"